Climbing is a skill children master incrementally, as they reach developmental milestones for various gross motor skills, according to neurologist Lise Eliot. Climbing typically begins with crawling over objects, progresses to climbing onto objects such as furniture and is fully mastered when children are able to walk down stairs unassisted using alternating feet. There are several components of motor development that contribute to a child's ability to climb. Crawling is among the first of the motor developmental milestones children reach. Children become truly mobile when they crawl for the first time, and most children spend several months mastering skills associated with crawling such as holding up their heads, supporting their weight with their hands and focusing on an object with their eyes. Most children begin crawling between six and eight months. They typically begin by scooting on their bellies and after several weeks of practice, they are able to crawl with their stomachs off of the ground. Once children begin crawling, they begin climbing over small objects such as toys on the floor. This task is often challenging in the first few weeks of crawling. Most children begin pulling up on objects and walking with the assistance of adults between nine and 12 months, according to the textbook "Child Psychology." Some children begin attempting to climb onto furniture before they are able to walk. Shortly after babies walk with assistance, they take their first steps unassisted. It normally takes babies several weeks to be able to walk competently. When they have mastered walking, they often begin attempting to climb from the floor onto objects. Some children climb onto stools and chairs. Parents should supervise children during this period because babies and toddlers are unaware of the risks of falling while climbing. Stairs are difficult for children to master. Babies as young as 6 months old may try to crawl up stairs, but are typically not coordinated enough to do so without falling. When children have been walking competently for a few months -- usually at about 15 or 16 months old -- they can walk up stairs with adult assistance. They then progress to walking up stairs using handrails at about 2 years of age. The final stage in this development is the ability to climb down stairs without assistance. Children first do this between 2 and 3 years and often do not alternate their feet. By 3, most children can walk down stairs alternating their feet. Climbing tasks such as climbing ladders are complex tasks that require children to have good balance and coordination as well as enough strength to hold themselves upright while climbing. The age at which children are capable of completing these tasks is often heavily influenced by the child's environment. 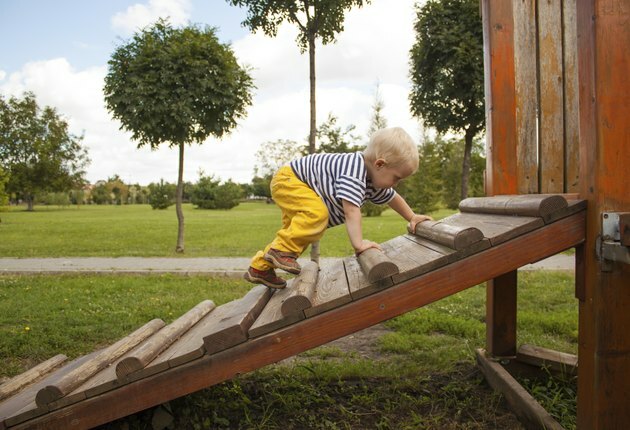 Children with active parents who help them learn to climb can frequently climb playground ladders between 3 and 4, though they should always be supervised. Full climbing skills often do not develop until children are school-aged, around 6 or 7 years, according to Dr. William Sears.